For This Is MY Preparation! “For this is My preparation, this is My table that I have prepared and set for you, even in the presence of your enemy. “So I set this table for you to eat and partake of all that I have prepared for you it is about keeping you strong, spirit, soul, and body. “I thought long and hard concerning you and where you are and what was going on in your life and I set a table,” says The LORD. “Every word that I send, every song that I give to you it is so you might arise and shine brightly. “I have given you milk for wherever you are in your walk with Me, if you are a babe I set a table of strong milk. “If you are growing by simply obeying I give you a table of bread, and if you are strong in Me I give you a table of meat. “I set a table,” says The LORD, “and it is fresh, fresh, fresh. I do not give stale things, I give you fresh manna from heaven. “So today I AM depositing and downloading into you a fresh table,” says The LORD, “and it is in preparation for what the enemy desires of you this week. “The enemy is constantly seeking whom he may devour, but I say to you this week as you partake of this table you will be strengthened from on high. “You will have the ability to rise up and ride over everything that the enemy can deliver or bring to you. “For not only will words of My songs come back to you, but every word that I plan for you to take and partake of will cause you to mount up with wings as unto an eagle and you will soar. “You will not walk like mere men but you will soar over the circumstances of this life. You will begin to see things in advance because you will have the eagle eyes and you will see plans, and purposes clearly and you will know exactly what to do because I have prepared a table just for you. “Like newborn babies you should crave (thirst for, earnestly desire) the pure (unadulterated) spiritual milk, that by it you may be nurtured and grow unto [completed] salvation,” 1 Peter 2:2. “But those who wait for the Lord [who expect, look for, and hope in Him] shall change and renew their strength and power; they shall lift their wings and mount up [close to God] as eagles [mount up to the sun]; they shall run and not be weary, they shall walk and not faint or become tired,” Isaiah 40:31. 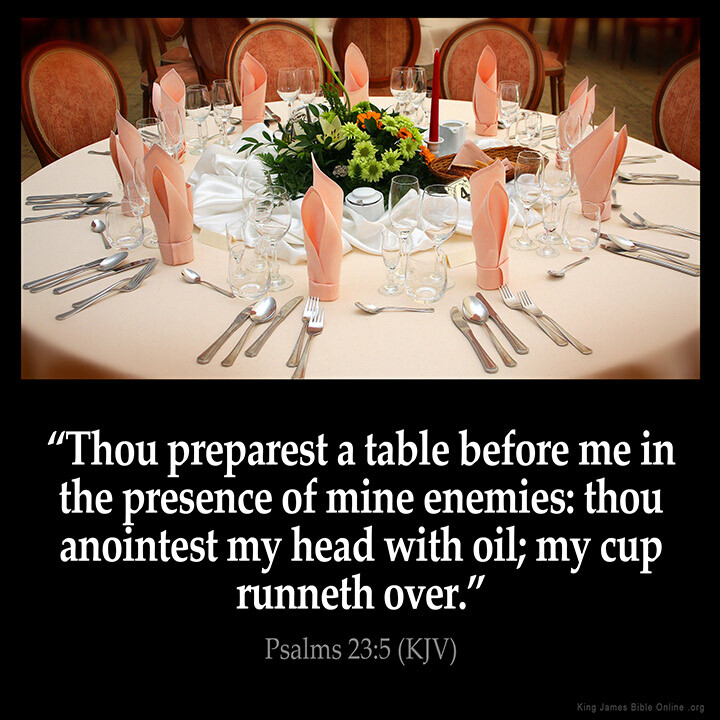 “You prepare a table before me in the presence of my enemies. You anoint my head with oil; my [brimming] cup runs over,” Psalm 23:5.